It's Like A Virus Scan For Twitter. Prevent impersonators from replying to your tweets and scamming your followers. You are the scammer's first victim. Scammers do what they do because sometimes they're successful. Don't let them victimize your followers pretending to be you. The browser tab title will change to notify you of an impersonator. eg (1) Scam Clerk. You'll also see when you have gained or lost followers while logged in. Reduce your follow list and remove friends who might have abandoned their Twitter account. We'll scan each friend and let you know the last time they were activite. All impersonators are added to the SCUM list. 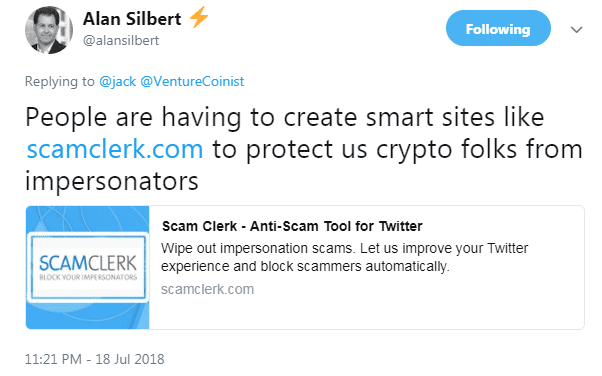 The Scam Clerk Universal Master list is a collaborative effort among Scam Clerk users to block *all* scammers, not just their own impersonators. Protect your image. Prevent impersonators from taking advantage of the good will you have built on Twitter. 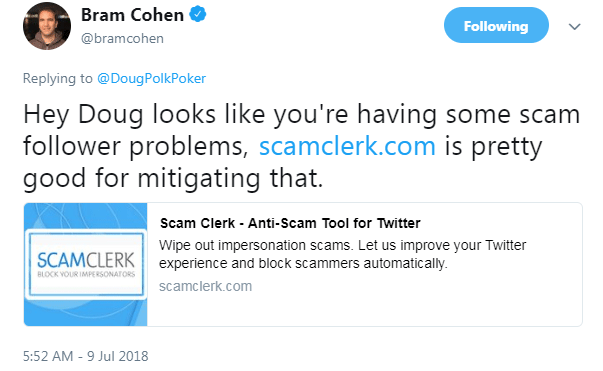 Using Scam Clerk to block scammers means you can rest assured the problem is being addressed. Bram Cohen, Creator of BitTorrent. Jameson Lopp, Cypherpunk, CasaHODL engineer. Alistair Milne, Altana Digital Currency Fund. Alan Silbert, Executive MD at INX Exchange. Just keep Scam Clerk open in a browser tab. Scans your mentions automatically and also searches Twitter for similar names. See your impersonators and block them easily. Wipe Out Impersonation Scams. 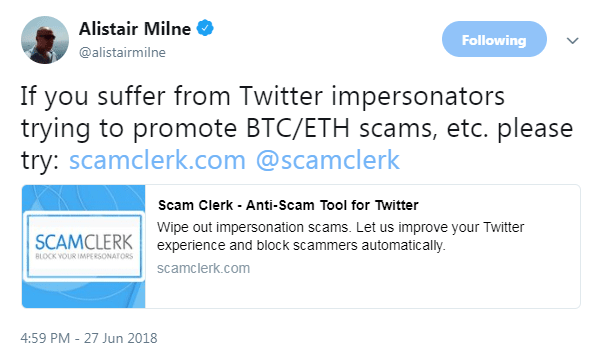 Let us improve your Twitter experience and block scammers automatically.